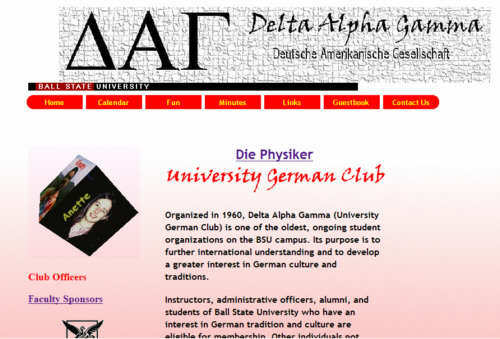 Way back in 2000 I was an officer in the Ball State German Club. My main contribution to the club was the creation of a website, which is still up and can be viewed here. In the end it was a disappointment, because almost never would a German student consult it, even though, at that time, it had its own domain name. For some reason, members of language clubs never visit their club's site. And the next two administrations failed to update or maintain it. Since I no longer attend Ball State, and the site is hosted on the university servers, it will probably soon disappear. Enjoy it now while you still can!